Sciency Thoughts: Borniopsis mortoni: A new species of Galeommatoid Bivalve from Shikoku Island, Japan. Borniopsis mortoni: A new species of Galeommatoid Bivalve from Shikoku Island, Japan. Galeommatoid Bivalves are an extremely diverse group of bivalves from shallow and intertidal waters around the world. They are noted for the commensual relationships that many species form with other invertebrates, living either on the bodies of their partners or within their burrows. Members of the genus Borniopsis are known from around the coast of eastern Asia, where they have been found living on the bodies of Mantis Shrimps, Crabs, Holothurians (Sea Cucumbers), Sipunculid Worms, Echiurans (Spoon Worms) and probably Tanaid Crustaceans. In a paper published in the journal ZooKeys on 7 September 2016 Ryutaro Goto of the Museum of Zoology and Department of Ecology and Evolutionary Biology at the University of Michigan and Hiroshi Ishikawa of Uwajima on Shikoku Island, Japan, describe a new species of Borniopsis from Sea Cucmbers found on mud flats at the mouth of the Souzu River on southwestern Shikoku Island. The new species is named Borniopsis mortoni, in honour of Brian Morton of the Univeristy of Hong Kong for his contributions to marine biology, marine ecology and malacology, including the discovery of many Galeommatoid species. 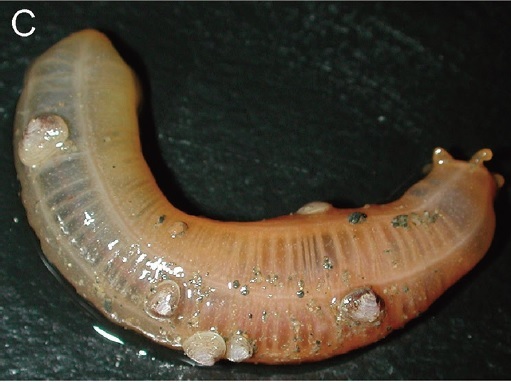 Borniopsis mortoni was found living on the bodies of the Sea Cucumber Patinapta ooplax, a Worm-like burrowing species, with about 70% of the Sea Cucumbers inspected hosting the bivalves and some having more than ten attached. Patinapta ooplax with multiple individuals of Boriopsis mortoni attached. Goto & Ishikawa (2016). The Bivalves are small, with the largest specimens reaching 4.1 mm by 2.8 mm, and have thin, elongate and slightly inflated shells. 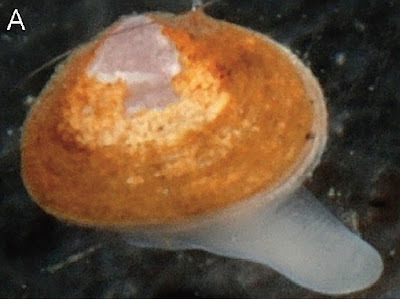 The periostracum (covering of the shell) is tan to brown, withblack markings. They attach to their hosts using both their foot and byssal threads (thick silky threads produced by some Bivalves as a way of attaching themselves to substrates). A crawling individual of Boriopsis mortoni. Goto & Ishikawa (2016). Cave-in at Polish copper-mine kills two. Landslide kills four in Gorkha District, Nepal. Numerous injuries after Macedonian Earthquake. Asteroid 2016 RO17 passes the Earth. Asteroid 2016 RB1 passes the Earth. Imaging the inner disk of LkCa 15. Asteroid (357024) 1999 YR14 passes the Earth. Landslides kill at least eleven people in Nepal. Asteroid (281375) 2008 JV19 passes the Earth. Tropical Storm Hermine makes landfall in Florida. Eruptions on Mount Santiaguito triggers lahar. Magnitude 5.5 Earthquake in central Chile.